Say it with me… I’m NEVER moving again! In less than 15 hours the movers will arrive to cart all of our worldly belongings to our new apartment, and at this point, I am just exhausted beyond caring. Are you impressed that I’m still participating in FFwD this week? Don’t be. This is an act of pure procrastination. I’m not usually one to get emotionally attached to “things.” I’ve spent years abusing my two pack rat brothers, both of whom seem physically incapable of throwing anything away. But this move is proving a bit more emotional that I had expected. 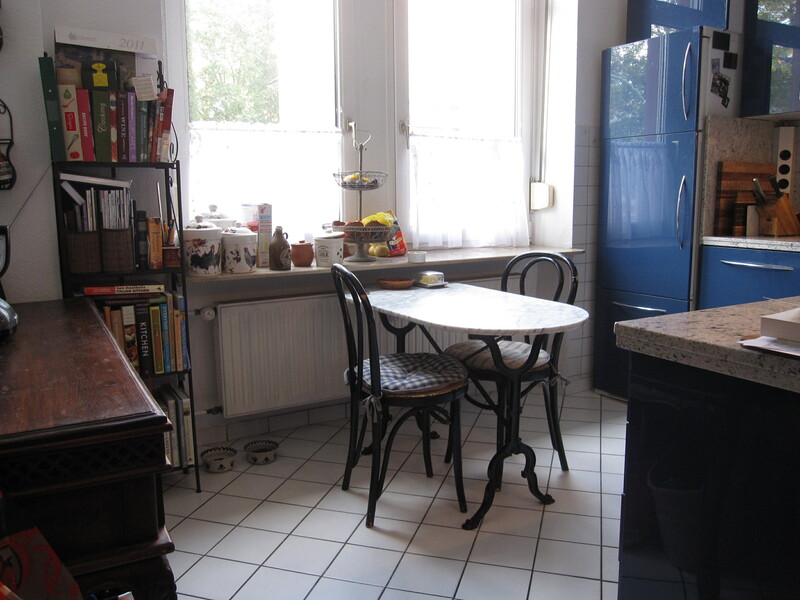 This was my first home in Germany and my first home together with my husband. It’s where I learned that he likes his tea black and his coffee loaded with as much milk and sugar as possible, and that neither is apparently considered an appropriate substitute for breakfast (this was news to me). That the Germans are very proud of their bread (rightly so, by the way), and that if the house was burning down, he’d probably grab the watercooker first. It’s where I learned that things are a little different across the pond. Ovens are smaller, pillows are bigger, and closets don’t exist. The first floor is on the second floor. The butter is stronger, the flour is weaker, and brown sugar = soft sugar = a trip to the specialty British store on the other side of town. It’s been quite a ride and I’ve actually come to love my little blue kitchen. This week’s French Fridays with Dorie recipe was the last official real meal made in that kitchen. Somewhere in the pile of boxes that surrounds me is photographic proof that I made it. But my husband was in charge of packing the electronics and now I have no idea where my camera is. You’ll just have to believe me. I made it, it was very good, we will make it again. This entry was posted in french fridays with dorie, life in germany and tagged Around my French Table, side dish, vegetarian. Bookmark the permalink. You’re halfway there! Good luck. Moves. Ugh. I feel your pain. I think packing up is the worst part of moving – there is such pressure to meet the moving deadline. When you are unpacking, it feels like there is less of a burden to have it done in a set time. Heck, I have boxes that have taken three moves with me (I know, I know, that is a whole other issue…). I agree with Cher…packing up is the worst part of a move. I always enjoyed unpacking…new clean start! Enjoy your new home and all the new memories you will make there! Glad you liked the leeks…they were a hit with me, too! I love your little blue kitchen and the trip down memory lane. Glad you could squeeze one more in before the move. Good luck! Good luck with your move. I am duly impressed that you made this dish! And I love, love your cute kitchen!!! What a wonderful post, getting all your thoughts and memories down in writing. It’s okay to feel sad and emotional (especially when youi’re exhausted) over a move like this. I certainly do feel your pain – you’ve all walked my moving journeys with me the past two years. And, I will say it with you. I am never moving again. Unpacking is the fun part. Having less “stuff” is great. Cudos to you for making this week’s recipe. Yes, I believe you also. When I lived in the Netherlands (I was in high school) we had a refrigerator just like that except it was candy apple red. I BEGGED my dad to let us take it home when we had to leave. BEGGED. Who begs to take home a refrigerator? Me. I suppose I”m one that has attachment to things as well. But its really the feelings behind the things and what would life be without those? Good luck with the move! Even if it was a procrastination tactic, I was impressed you fit this last recipe in before the move. I think when I have to move, I’ll have a nervous breakdown. I am a packrat, and though I’ve been trying to shed things to be able to move someday, I haven’t been very successful. Hope the move goes well, Rose. I look forward to posts from your new home, and pictures of your new kitchen. Good luck and YES I am SUPER IMPRESSED that you made this amongst the moving chaos! Dear Rose, the best of luck with your move and your new home and, yes, I am impressed that you managed to prepare the leeks mimosa while packing up your belongings! Hope all went well in the end! One chapter closes and a new one begins……. looking forward to your cooking adventures in your new kitchen! What’s a watercooker? I’ve never even heard of one. I hate moving, but I’m impressed that you managed (and still managed to cook the leeks! ).